Gran Colombia is a name used today for the state that encompassed much of northern South America and part of southern Central America from 1819 to 1831. This short-lived republic included the territories of present-day Colombia, Venezuela, Ecuador, Panama, northern Peru and northwest Brazil. The first three were the successor states to Gran Colombia at its dissolution. Panama seceded from Colombia in 1903. The Revolutionary Armed Forces of Colombia – People's Army is a Marxist–Leninist revolutionary guerrilla organization based in Colombia, involved in the ongoing Colombian armed conflict. It claims to represent the rural poor in a struggle against Colombia's wealthier classes, and opposes United States influence in Colombia (e.g. Plan Colombia), neo-imperialism, monopolization of natural resources by multinational corporations paramilitary and government violence. It is funded principally through ransom kidnappings, gold mining and the production and distribution of illegal drugs. FARC was established as a military wing of the Colombian Communist Party after government military forces attacked rural communist enclaves in 1964. FARC is described as a terrorist group by the governments of Colombia, the United States, Canada, Chile and New Zealand, as well as by the European Union. The governments of Venezuela, Brazil, Argentina, Ecuador and Nicaragua do not classify FARC as a "terrorist organization". The term Plan Colombia is used to refer to U.S. legislation aimed at curbing drug smuggling and combating a left-wing insurgency by supporting different activities in Colombia. 1. Colombia has the second largest population of any Spanish-speaking country in the world, after Mexico. 2. It is the only country in South America having coasts in the Pacific Ocean and in the Atlantic Ocean. 3. As of 2011 Colombia remains the world's largest producer of cocaine,although production has been falling. 4. 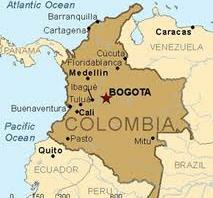 Its capital is Bogota and official language is Spanish. 5. According to a 2011 United Nations report, Colombia was one of the seven most income unequal countries in the world during 2010. 6. In the economic outlook in 2050 by HSBC, Colombia is seen playing a decisive role in the global economy, especially in the Americas as the number 25 in the world economies measured by GDP. This group has been called CIVETS (Colombia, Indonesia, Vietnam, Egypt, Turkey, South Africa). 7. Colombia is the fourth largest oil producer in South America and it is estimated that by 2012, Colombia will be producing a million barrels a day.